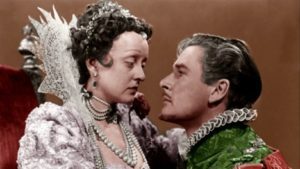 This film tells the story of the doomed romance between Queen Elizabeth I (Bette Davis) and the Earl of Essex (Errol Flynn), their love thwarted by the machinations of rival courtiers and by the lovers’ own unbending pride. Based on a hit 1930 play by Maxwell Anderson, it’s darker and talkier than most Flynn vehicles, and Bette Davis famously didn’t want him for the role, afraid he didn’t have the dramatic chops for it. She preferred Laurence Olivier—but as it happens the part suits Flynn and he does just fine, as Davis herself admitted years later. Elizabeth and the much younger Essex adore each other but can’t get along because each is ambitious to rule. So he’s always getting sent away from Court, and when separated they both get to gnash their teeth and pine and yearn. Meanwhile in the palace, quarreling and conspiring, are the royal courtiers, vicious rivals to Essex played by a fine bunch of English actors, including Henry Stephenson, Donald Crisp, and Henry Daniell—though all are overshadowed by the delightfully supercilious Vincent Price as Sir Walter Raleigh. Wow, he’s good, even wearing ridiculous silver armor and pink trunk hose for the purpose of being mocked for it by Essex. Also at Court is Olivia de Havilland as a lady-in-waiting who’s pining for Essex, but her brains and poise are wasted here, as the role gives her little scope for them. At least she gets to be called a “brazen wench” and “shameless baggage” by the queen. This is a top-of-the-line production, in brilliant Technicolor, with fabulous costumes by Orry-Kelly and a swooning score by Erich Wolfgang Korngold. It looks great. The bickering between Elizabeth and Essex does get tiresome, though to their credit Davis and Flynn manage to carry it off. By the time the smirking courtiers manipulate Essex into undertaking a hopeless invasion of Ireland, we’re ready for some swordplay as a break from the wordplay. Of course, it all goes wrong, as invading Ireland is always a sucker move. And there among the bogs Essex is defeated by—oh, ignominy of ignominies—the wretched Alan Hale, Sr., as Lord Tyrone. Beaten, Essex returns to England, and yet more angst. There’s still a good deal of talk ahead before the final, tragic end—and fine talk it is, too. You might like it.